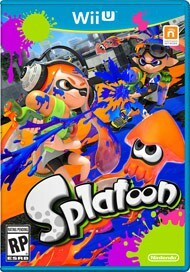 Splatoon is Nintendo’s newest IP and a new take on a team third person shooter being much more objective-based with any kind of enemy defeating being much more secondary. One big thing with Splatoon though is it’s kind of hard to show how fun it is without actually playing. While I can think of a few exceptions, many people I know were in the same boat as me–“Well, it looks okay, but…” and once we actually got to try it, suddenly we understood just how fun it could be. Overall, the game manages to bring a lot of uniqueness in a genre that tends to feel a bit overdone at this point and while I do have some nitpicks, it’s a game I’ve been enjoying quite a bit. Plus there will be free DLC throughout the year and that’s always a nice bonus. But yes, we should probably get into the full part of the review before I discuss everything here! Splatoon is essentially an TPS (Third Person Shooter) game, but focuses much more on the objective and less on kills. While defeating your opponents isn’t completely useless, for the most part if you only spend your time doing that, you’ll have a lot of trouble winning. I’ll talk more about the individual modes in the next section. Controls are mostly pretty intuitive, but I found the button usage for specials (holding down the toggle then hitting another button) to be quite uncomfortable and just hard to really get done quickly which is kind of needed in these games due to how fast-paced each level is. Gyroscope can be a bit of a pain in my personal opinion, but I know a lot of people prefer it. Thankfully, you can turn it on or off for what you prefer which is nice as I prefer using the toggle to look around and aim instead. The story for single player is rather simple–the Octarians have stolen the Great Zapfish (who looks an awful lot like a Whiscash, but I digress) which powers up Inkopolis Plaza. Thus, your goal is simple–you must save all the Zapfish and the Great Zapfish. The Single Player is actually pretty long with a fairly large hub, 27 different levels, separate currency for gear to upgrade (and some new sub weapons), and 5 different boss fights. How long it takes you can vary, but if you keep replaying to grind up all your gear plus practice for the Amiibo challenges, you can easily put more time into it than you’d expect. Captain Cuttlefish is pretty awesome and you learn quite a few neat things about certain characters at the end. While the final boss battle is incredibly long (especially in comparison to the previous bosses), it gets pretty amusing near the end which helps lessen just how frustrating it can be. The Single Player is easily a lot of fun, though, can get frustrating and has some areas that are just excessively difficult in comparison to other parts of levels. Regardless, it gets you a lot of practice and even teaches you some cool tricks for the main mode of the game and if you unlock all the scrolls, you can find yourself getting plenty of new guns and gear which will give you a good leg up in Turf War. Finally, if you want something a little more relaxing, there’s always Squid Jump which you can play while waiting for matches and in using the arcade machine in the Plaza. There are 25 levels and it’s styled like a classic 8-bit game. Multiplayer consists of several modes: Turf War, Ranked Matches, the Battle Dojo, and from time to time: Splatfests. If it wasn’t obvious from all the modes, this is pretty much the main chunk of the game… however, nearly all of it requires you to be online. Battle Dojo is the only exception and it requires another player. Regardless, I’m going to talk about each mode separately as there’s really a lot to say here. Turf War is pretty much the main chunk of the game. The objective is simple–try and ink up the floor part of the map with more of your color. Whichever has the most color down wins. It’s a simple concept, though, I think some people get too focused on the fact that you can kill the other team. Overall, it’s nice to have a third person shooter that really puts so much focus on objectives and it makes it a lot more fun for me to play… of course, that doesn’t get rid of all the campers. This mode is also the main way to unlock more abilities for your skills and how you level up. Max level is 20 (whether this could change in the future or not is unknown though). Turf War isn’t perfect though–with so few maps, it gets a bit tiring seeing the same scenery over and over. Some maps are easily better than others and to make matters worse, you will only cycle between two every few hours (and generally will get the same map about 4 times in a row until it switches to the other one). This then becomes further frustrating as every time the maps change; if you’re anywhere besides single player mode you will get a newsflash from Callie and Marie talking about them. While it’s a neat touch, it gets boring/repetitive very quickly and just desperately needs a skip function. While new stages are planned to be added as the year goes, the rotating stages will still be a thing. It looks like there could be a slot for a third stage in each of the rotations, but one more stage that could be picked every few hours still doesn’t offer much variety. Speaking of free updates, you unfortunately can’t really have a set team with friends until a big update in August. I don’t know why this wasn’t released at launch, but it’s kind of a downer that it’ll be several months before we have it. The game still has a lot to do, but if you were one of the people really looking forward to making a set team, it’s still a huge disappointment. The oddest thing though is you can actually play two of the upcoming stages in single player which makes me wonder why they are being held off in the first place. Which brings me to my biggest issue with Turf War… you can’t go online with a friend. With the way Super Jumping works and the map, I’m guessing it would take some work figuring out a way to do it (I personally think a good way would’ve been having both people using a Pro Controller and then having it so you could select who wants to jump and then pick where on the map on the gamepad with a horizontal split screen on the TV or one person using the TV and another using the Gamepad and having the option to switch to the map or have it in the corner. You could even have the ability to use the D-Pad to pick who you want to jump to if you want jump to someone as that currently serves no function in multiplayer), but I just find it super disappointing. I know I was looking forward to playing with friends and family nearby with those we know online and with only one Wii U, that isn’t possible. While you can change the appearance of your inkling at anytime (minus ink color which is sadly always randomly generated–even if you color lock, you’ll still randomly be either blue or orange), I’d much rather be able to play together rather than sharing a character and/or taking turns. Similarly, you can’t play offline. Now, I’m sure people are thinking “Where would the players come from?”, but story mode perfectly shows they could easily do computer players like the Octolings. Whoever you’re against (if you and your friend are on the same team which I’m guessing would always happen if going online together locally) will be Octolings and the remaining slots on your team will be computer-controlled Inklings. The Octolings worked fairly well and it just feels like such a missed opportunity. I will say the online tends to work pretty well at least. While I can’t say I’ve never been disconnected, it’s at least much rarer than other games I’ve played. That said, if you end up with one player down or lag, it can pretty much be a forced loss which is really disappointing–this is a game where one or more less players than the other team can pretty much destroy you. I really wish they made it so a computer-controlled Inkling/Octoling would take over if someone loses connection–similar to how a race will be finished by a computer if someone drops in Mario Kart 8. Ranked Matches require you to have hit level 10 from playing Turf War and are essentially just more objective based Turf Wars. They involve keeping hold of a certain area or thing and is probably where things that are more kill heavy can come in handy. You will also get a rank as you play (Starting at C- and going up to A+). I generally dislike ranked stuff–not only because they’re not always fair (could be a new Inkling, but a skilled player), but also just the fact that if you have friends with differing skill levels, you may never get to play with them. I think these would be fun modes to play offline or even just in a free for all Turf War in general so it’s a bit disappointing to see them specified to a specific mode. Especially as more game modes for Ranked will be coming in the future. The Battle Dojo is the local play mode and is a mode I actually find rather boring. You and a friend (one using the gamepad as a screen and the other using the TV) essentially go around and shoot balloons for points. Beams of light will show where they will appear and you can also kill your friend for them to lose points. If you hit 30 points, it’s an auto-win. The last minute of the game doubles points. These games are each 5 minutes though which I actually feel is a bit long–I feel like 3 minutes like Turf War would be better (and while sometimes I kind of wish Turf War is longer, 3 minutes does actually work pretty well). The mode just starts to drag on after a while and it’s really just the introduction tutorial with friends in different stages. Finally, Splatfests. These are special events that get announced ingame a week before their start date. They don’t last very long (in fact, our very first one will only last for 24 hours) and generally require a lot of battles to win. The way they work is a poll will be started and a voting booth will appear next to the Miiverse box. Whichever you vote for will be the team you end up on. Once the Splatfest begins, this will be the only mode you play. Your clothing will also be replaced by a special Splatfest Tee (which will look like whichever you voted for and don’t worry, they have the same stats). Splatfest will find you 3 more players for you to team up with who voted the same and then the challenge is on. Splatfests are the main way to earn Super Sea Snails which Spyke requires for his services. It’ll take a lot of playing and work though. How many super sea snails you get depends on your title when the Splatfest ends. There’s 5 different titles. As long as you participate, you will at least earn 2 Super Sea Snails. If you manage to get the maximum experience of 184, you will earn 12 Super Sea Snails and if your team happens to win, your earned Sea Snails will be doubled (so you can earn anywhere between 2 to 24). While 184 experience may not seem like much, experience points are earned much differently during Splatfests. You only get one bonus point if you earn 200-399BP for example and can only win up to 5 per round. That means it could take you over 9 hours of Splatoon to get the max rank… and with only 24 hours to do it, it’s not exactly very fun. The winner is chosen based on popularity (whichever got the most votes) and the percentage a team won. Win percentage actually has a higher value than popularity rating so even if you feel your team may get less votes, if you play well you may be in for a win overall. Unfortunately, you do not get to keep the shirt you get from the Splatterfest which is pretty disappointing. I think it’d be a nice souvenir of knowing you participated. There’s a large amount of weapons and clothing in Splatoon. Unfortunately, while they did their best to vary the skills and abilities of things… it’s really disappointing compared to letting us pick our own things. Before I fully get into this, I will say there are more things coming through DLC so there is always a chance it could get better. I’ll start with the weapons. There are currently about 30 weapons in the game with most being a Blaster-type weapon. Each weapon has a sub-weapon (1 of 10 different ones) and a special (1 of 7 different ones) and as you can probably guess from how I started this section, they are pre-chosen. This means if you have a favorite weapon, there is a chance its sub-weapon and/or special are not your cup of tea. Or maybe you enjoy one, but not the other. There is no way to change these at any point so try to at least pick one that has 2/3 if you can’t find something to settle with all. I really wish there was a separate skill shop (or a way to at least change them properly) where you could buy and slot skills for your gear. It’s just disappointing there isn’t and if there’s one thing that drives me crazy, it’s Nintendo adding customization to their game and then making it have forced stats. I really hope they add more outfits with skirts instead of just shorts. There’s no reason there can’t be shorts under the skirts and I’d really like to dress my Inkling up in something girlier. It’s just pretty bad. Moving away from my issue with the lack of skirts & dresses, let’s get onto abilities. There are currently 24 different abilities in the game. Each wearable item comes with one ability you can not change. Then there are up to 3 random sub-abilities per item. While these can be changed to an extent, they work at 1/3rd of the power of your item’s main ability–you would need to get the same sub ability 3 times for it to be equal in power to your main ability (and yes, the abilities do stack). The slots are determined by the star rank of the item and to get more slots for a lower star rank item (which, thankfully is possible) you need to talk to Spyke with some Super Sea Snails. Unfortunately, as mentioned previously those are earned through Splatfests for the most part. While you can buy them from Spyke at level 20, they cost 30K each and just are kind of overpriced for something he’ll be getting back anyway. Super Sea Snails are also how you reroll sub abilities. After all, they are picked randomly and you may not want that ability. Unfortunately, not only is it random what he rerolls to, but he will reroll every single one you have so if you like some of your sub abilities, you may want to think if it’s really worth the risk to lose something you do like. While I don’t mind the random sub-abilities to an extent, I think it’s messed up that it’s still random when you pay to change them. And like with weapons, I wish you could specifically pick the main ability you want. This kind of thing leaves me in the same position as I feel in Mario Kart 8–I can either wear the outfit I really want to or I can use something that fits my play style more and there isn’t really a winning situation here. Finally, as for your Inkling’s physical appearance customization, it’s rather lacking. As previously mentioned, you can not choose your ink color. I would’ve loved to color lock pink and teal as it’s my favorite match up and I love playing as pink, but it just isn’t possible. The only things you do get to choose are you eye color and if you want to be a girl or a boy. Boys have their “hair” tied back while girls have theirs hanging down… and I think it’s silly that they are limited to gender. With so much unisex, I think it’d be nice not only to be able to pick which you want to use regardless of what gender you play, but also just have more choices to begin with. I know I especially adore Callie’s hair and it’s super disappointing that you’re essentially stuck with one hairstyle based off the gender you play. Sure, you can switch genders at anytime for a hairstyle switch, but I just think more choice would’ve been nice. Splatoon is a fun game. Despite my nitpicks and issues with it, I still really enjoy it. I think my biggest issue is that it could’ve been better with just a few changes/additions. With free DLC coming, there’s always a chance for more things we don’t even know about and it still gives us a lot to look forward to. The Amiibo also add a good amount more content in the single player game if you don’t feel like playing online all the time. That said, I wish they were a bit more bonus challenged base versus “hey, go play the levels you did before but with this instead!”. I feel like the Squid gives a bit of a more challenging atmosphere with the limited ink mechanic, but I just wish it had more silly challenges versus just doing the same thing with a different weapon–especially as, while possible, some of the levels just work so poorly with certain things and it can make the fun of it suddenly become a lot more frustrating. If you’re still unsure of the game, I’d highly recommend seeing if there is a demo near you or a way to try it. It’s really a game where experiencing it is the best way to determine how to feel versus just watching videos or reading what people have to say. If you do enjoy shooters, I feel this definitely brings a unique and fresh look to the genre which could really use it. You don’t need to be dark and gritty to have fun.